Need Some Help Cleaning for the Holidays? Trying YOUNG LIVING’S Cleaning Gift Set! 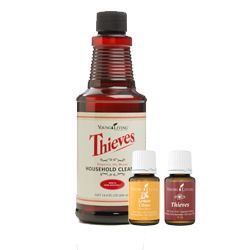 This set includes Thieves Household Cleaner, a 15ml Thieves Oil, and a 15 ml Lemon oil. The perfect combination for you to get your home looking and smelling great! THIEVES Household Cleaner is an all-purpose, concentrated cleaner formulated with 100 percent plant and mineral based ingredients. It is biodegradable and complies with EPA standards. THIEVES OIL is a blend that contains powerful oils that can be used to diffuse throughout the home to neutralize unwanted odors. It can also be applied to the bottoms of feet. It’s essential ingredients include clove, cinnamon bark, rosemary, lemon, and eucalyptus. LEMON OIL is cold pressed from the fresh fruit peel of lemons grown in Argentina and the United States. it has refreshing and cooling properties and when used as a diffuser is an instant pick-me-up thanks to its fresh and citrus scent! This amazing combination will leave your home smelling fresh and clean and ready for all your family visits this Holiday Season! Click on the link below to be taken directly to the YOUNG LIVING page where you can register to become a member and receive not only AMAZING discount pricing but the convenience of everything being shipped quickly, efficiently, and directly to your door!